Marriage is one in a lifetime affair and every girl wishes to be in a grand wedding look. Our stunning Bollywood Divas are also like that and it can be seen in their marriage. Some of our stunning Bollywood stars such as Aishwarya Rai, Sonam Kapoor, Anushka Sharma, Shilpa Shetty and Kareena Kapoor sparkled in their gorgeous wedding outfit. Aishwarya wore the traditional yellow and golden Kanjeevaram saree and looked like a princess during her wedding with Abhishek Bachchan in 2007. The designer of the saree was Neeta Lulla and costs Rs. 75 lakh. The saree was crafted with gold border and studded Swarovski crystal. Kareena Kapoor wore a Khandan attire which was gifted by her mother-in-law Sharmila Tagore during her wedding with Saif Ali Khan in 2012. Apart from that the famous designer Manish Malhotra designed a wedding dress for Kareena of her taste which was a maroon and burgundy lehenga worth Rs. 50 lakh. She paired it with heavy diamond necklace with gold and other precious stones studded in it. During the marriage of Shilpa Shetty and Raj Kundra in 2009, Shilpa wore a red coloured saree which was designed by Tarun Tahiliani, sophisticatedly with 8000 Swarovski crystals on it and costs Rs. 50 lakh. Moreover, her wedding ring costs Rs. 3 crore. The diva completed her look with outstanding Kundan jewellery with uncut diamonds and emeralds from Anmol Jewellery. 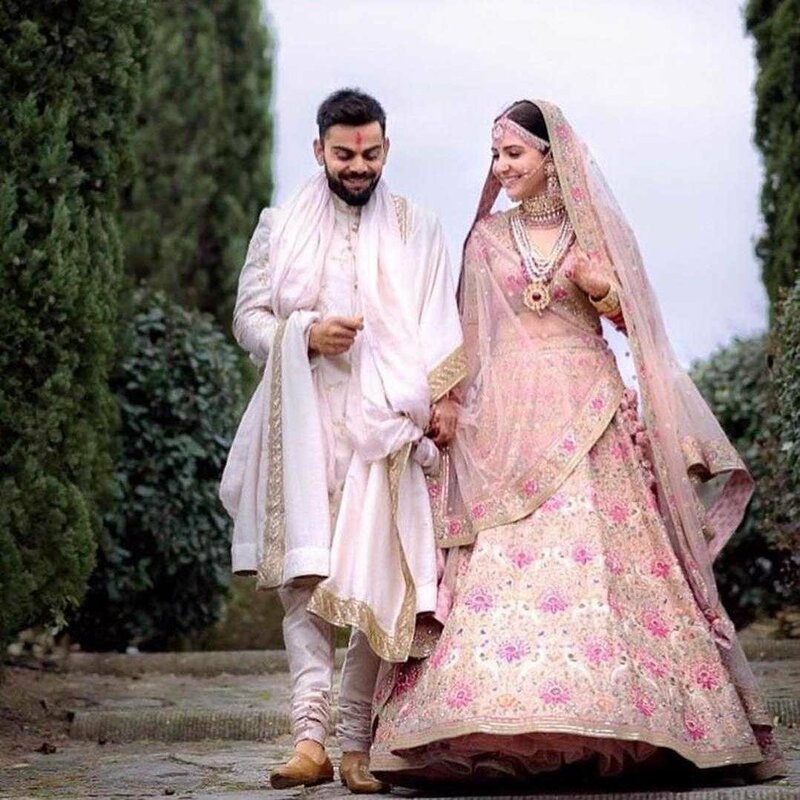 Anushka Sharma married to Virat Kohli in a private ceremony in Italy. She was one of the most elegant brides ever seen. Her outfit was designed by famous designer Sabyasachi which was a pale pink-coloured lehenga which costs Rs. 30 lakh. Sonam Kapoor married to Anand Ahuja few days before also gathered everyone’s attention. 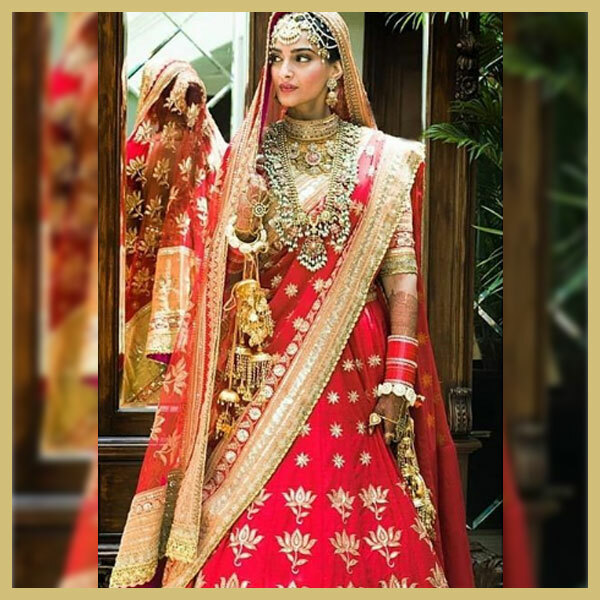 Her wedding dress was designed by Anuradha Vakhil which was red and gold lehenga which was accompanied with stunning vintage style jewellery-a chocker layered with a guttapusalu necklace and multi-stranded matha patti completed her look. It costs around 90 lakh rupees.